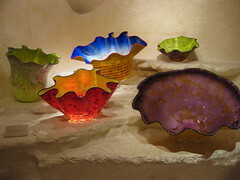 The Hakone Glass Forest is a large collection of Venetian glass, with galleries of contemporary glass artists, in a setting trying to recreate an Italian lake villa. 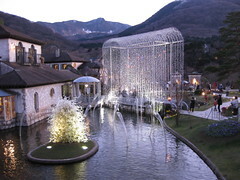 The central features are a curtain of glittering crystals that sandwich a bridge over an artificial pond, and a Christmas tree of crystals. 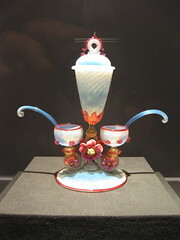 The Venetian Glass Museum is impressive, spanning the full range of glass artistry form fine crystal to fimo, many from the times of the Doges. 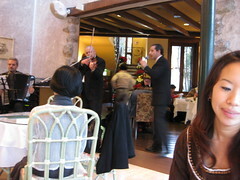 Inside the museum there are regular performances by a playful violinist and a stoic accordionist, both Italian. 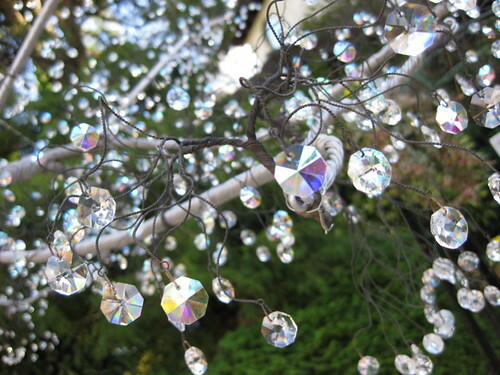 Check out pictures of the beautiful works here. Later when we had coffee and croissants at the café (coffee was excellent by the way), the musicians joined two more Italians, a keyboradist, and a slick friendly lounge singer for more music. It was great. It really added some authenticity to the faux Italian atmosphere. 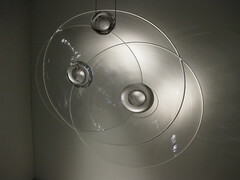 The galleries of contemporary artists extends the education in glass art to its contemporary interpretations. In particular I really enjoyed the cerebral abstractions of Livio Seguso, and the lush colorful organic forms of Dale Chihuly. The gift shop is pretty sizeable and there are many displays of artisans from around the world for sale. It was an art gallery all its own. The Glass Forest is a compact place but there are enough nooks and crannies, galleries and shops to fill an afternoon. And the education in glass traditions was particularly edifying in this romantic ambiance. For more info, here’s the official website’s information page, only in Japanese. Photo at the top by T. Funada. Your photos are fantastic! I just visited the museum last week. thanks linda! i hope you had a great time.